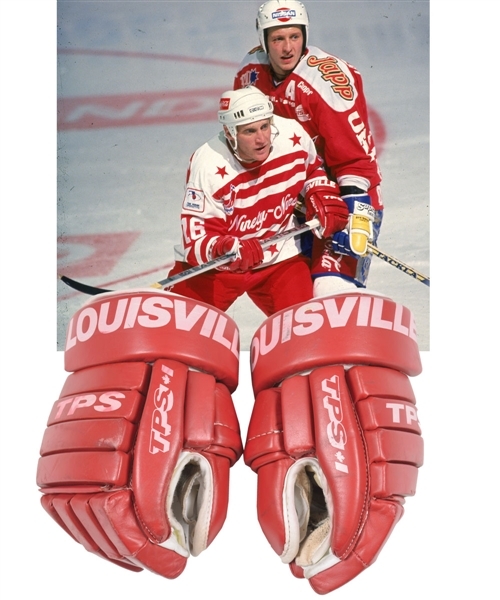 The brainchild of Wayne Gretzky, the Ninety-Nine Tour featured exhibition games played by Wayne and his friends in 5 different countries during the NHL lockout, in 1994-95. 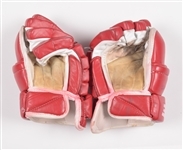 We have a pair of gloves worn during the tournament games by Brett Hull. 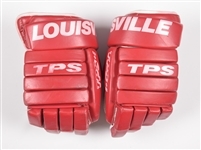 Louisville TPS models in solid red with white accents, all identifiers are screened on, with the gloves exhibiting nice use, with scrapes and wear to the leather, with some of the red colouring bleeding onto the glove’s white segments. The palms also show wear, with each free of rips or tears. A signed LOA from Brett Hull will accompany.